FREE Shipping – No minimum order! BURST’s super absorbent binchotan charcoal bristles remove more stains than regular bristles. Fact. 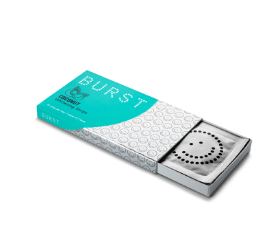 BURST's incredible battery life means that a quick charge gives an amazing 4 weeks of brushing power. This toothpaste is AWESOME!! I love the taste and it leaves my teeth feeling clean for hours after I use it! The whitening toothpaste has helped me ke..
Love the Sleek look of this brush. This is nice for me personally because I may not wash my hands clean of my makeup, ect before I brush my teeth. Thi.. Okay, so a few reasons why I personally love these; 1. 10 MINUTE APPLICATION 2. I did not experience ANY sensitivity 3. RESULTS ARE GREAT! 4. Not ..
Yall. This toothbrush is SO pretty!!! I already had the white brush, but when this came out, I had to get it. It is even prettier in person. This woul.. 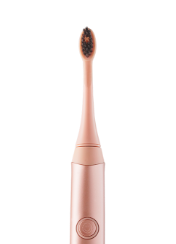 I love how clean and smooth my teeth feel after using the Burst tooth brush! I also love that it vibrates every 30 seconds so I know when you move to .. This paste is a satisfying "no burn" mint flavor. The perfect mixture of whitening ingredients and strengthening fluoride to keep your teeth white, st..
A toothbrush that feels like you're brushing and flossing at the same time! The charcoal bristles help whiten without being abrasive and the multi-len.. I ordered this Friday and it arrived by Monday. Super quick. I have to be honest I was going to wait a while before writing a review but after just on.. Absolutely NO SENSITIVITY and so easy to use!! I recommend getting a two week supply and using on DRY teeth. After seeing Awesome results from a patient using the Burst toothbrush I decided to try it and I Love it!! "A shopper's guide to making new year's resolutions that last"
"Shine bright this december with these editor-picked health and fitness finds"
"The uproxx gift guide for travelers and adventurers 2017 edition"
"Exciting new dental products for dental hygienists to discover this year"
"4 last-minute gift ideas for travelers"
"Charcoal is the secret to a cleaner mouth with the burst toothbrush"
"Every one loves a great looking smile right?" "I brush my teeth with charcoal powder and they've never been whiter"
"Need an electric toothbrush? 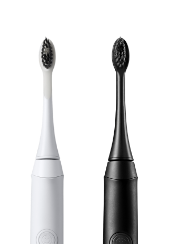 check out burst electric toothbrush: whitening charcoal heads for $18 year"
"The 7 best electric toothbrushes, according to dentists"
"Martha stewart weddings spring issue"
"Burst oral care electric toothbrush"
"Brittany stewart, coo and co-founder of burst"
"The startling link between your toothbrush and your hair health"
"At burst oral care, 100 percent of employees say their workplace is great." "Holiday gift guide december 2019"
"7 dental products that will make you look forward to brushing your teeth"
"Khloe kardashian has a secret to getting stains off her teeth & you'll never guess what it is"
"Over 25 cozy gift ideas for those who love being pampered"
"Burst oral care revolutionizes oral care industry with direct ship subscription business model, hygienist network and newest rose gold colorway"
"Comprehensive holiday 2018 gift guide: 68 christmas gift ideas for *everyone* on your list"
"Hot mama! khloe kardashian stuns only months after welcoming daughter"
"Khloe kardashian burst oral care"
"Shop khloe kardashian's all-time favorite beauty products"
"Khloe kardashian's all-time favorite beauty products"
"Star sightings: alicia keys attends mtv's staying alive foundation's 20th anniversary gala in new york city"
"December issue of health, who included the brush in their round-up of wellness inspired gifts." "The best black friday & cyber monday 2018 sales for fashion, sneakers and beauty"
"Get fit, get shredded, get happy - 12 ways to get motivated for the new year"
"16 ways to make focusing on wellness easier in the new year"
"Reasons to travel in 2019"
"Burst oral care limited-edition rose gold sonic toothbrush"
"Why it's time to switch to an electric toothbrush." "Goody bags: all the best holiday fashions, and the suitcases to pack them in"
"10 wedding registry items that'll simplify your morning routine"
"13 gifts for people who are impossible to buy for"
"30 beauty gifts under $100 that are almost too good to wrap"
"I tried the burst toothbrush made popular by the viral 'corn test' video - here's how it stacked up against my philips sonicare"
"27 tiny gifts that leave a big impression"
"Secrets to a sparkling smile"
Email Thank you. You have been added to our list. Select the quantity of strips packs you'd like to add to your subscription. This is the quantity we'll ship to you now and every three months. Cancel anytime. Select the quantity of toothpaste tubes you'd like to add to your subscription. This is the quantity we'll ship to you now and every three months. Cancel anytime. Please prove that you are a human. Try again! Which is the correct shipping address to use for this order? Please enter a vaild address. We found that the entered zip is not matching with any of the vaild states for United States or Canada. corporate gifting is 15 brushes. Invalid quantity found. Please add valid quantity to cart.